Filling the same mission requirement as the standard MS3 Sling, the MS4 can quickly switch between one-point and two-point configuration. The MS4 maintains material construction and specifications identical to that of the standard MS3, but features two heavy-duty push-button QD sling swivels rather than the Magpul Paraclip™ aling with a steel D-Ring to allow one to two-point convertibility. This modification allows compatibility with QD sling cups commonly found on lower receivers, receiver end plates, buttstocks, and many low-profile forward QD Sling mounts, including the Magpul RSA-QD. 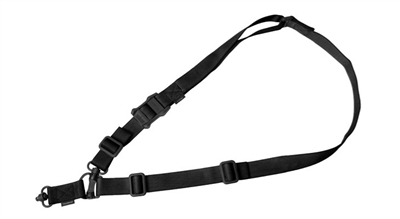 The MS4 Dual QD incorporates a new low profile quick-adjust Slider which minimizes bulk and allows for secure, yet effortless, sling adjustment. Webbing length has also been increased for a comfortable fit with all body types and armor configurations.